The Committee on Student Affairs shall consist of all 24 student Senators, as well as one non-Senator observer from Union Theological Seminary. One of its members shall also be a member of the Committee on Rules of University Conduct. Its jurisdiction shall cover matters of student life including, but not limited to, student organizations, student housing, extracurricular activities and student concerns in the community. The Committee’s jurisdiction, however, is restricted to matters of University-wide student concerns, and to concerns of students in more than one faculty or school. Where student interests are closely related to the interests of other groups in the University, the Committee shall cooperate with other appropriate committees of the Senate. The members of the Student Affairs Caucus (SAC) have had a productive year and have addressed several issues impacting university-wide student life. While much of this year’s more visible work has been in response to bias incidents on campus, SAC has also worked with the university administration to foster a greater sense of community across schools. SAC recognizes that it is the only body in the university that includes elected student representatives from every school in the university and affiliates. With that in mind, SAC worked this year to position itself as a resource for students seeking redress of university-wide student concerns and a resource for university administrators seeking the pulse of the student body, both graduate and undergraduate. Support for student senators to use their positions to serve the wider university while also working as a resource to address their respective constituencies, needs and concerns. Outside of the Senate, we sought to increase the unity among schools through university-wide events. Beyond Columbia, our goal was to foster greater community involvement and partnership. We met a number of these goals. The Executive Committee was very responsive to student concerns this year and allocated substantial attention to discussing both the Report on Bias Incidents and the draft mandate for the Commission on Campus Diversity and Equity. The Executive Committee also facilitated the SAC’s efforts to resurrect the University Senate’s Committee on Rules of University Conduct to review campus disciplinary proceedings. Student input also reached the plenary through efforts to enhance campus housing and library services and to facilitate socially responsible planning and practices during the University’s Manhattanville expansion. SAC’s work with the External Relations Committee was especially productive in investigating student concerns after the bias incidents. The collaboration between the committees not only resulted in the Follow-up Report to Student Affairs Caucus’ 10/26/07 Memorandum on Acts of Hateful Intimidation and Vandalism on Columbia’s Campus, but also served to launch a Commission on Campus Diversity and Equity. We hope the work between SAC and the External Relations Committee will serve as model for future collaboration. SAC members also sought to be resources for each other through research, support, sharing of administrative contacts, and the like. SAC members generally served the student body by bringing coordination gaps and inconsistencies to the attention of administrators. Senators also established opportunities to inform their respective schools about pending expansions into Manhattanville. This year, many senators have also shown great initiative and have used their position to make individualized contributions. Senators spoke at an MTA hearing to note student perspectives while challenging a potential fare hike. One of our undergraduate senators continued her work to create a more integrated sign-in dormitory procedure for undergraduate students at Columbia University. Other Senators collaborated with the Housing Committee to improve conditions in General Studies and Graduate Student housing. A senator from the Professional Schools provided opportunities for student mentorship. In coordination with Lisa Hogarty, one of our uptown senators secured new printing equipment and printing services for the Health Sciences Campus, increased bus service between uptown and downtown campuses, and made print quotas available across campuses/networks. He also provided insightful input into the library renovations process. Additionally, he worked with CUMC administrators to establish a better balance of interests among the different schools uptown. Another of our undergraduate senators worked with university libraries to increase study space availability by working on a new “anti-camping policy” and the launch of a study space website. This same senator also worked closely with administrators to communicate Sakai, the potential new platform for Courseworks, to the student body. Undergraduate senators also worked to provide better alumni relations. And lastly, one of our senior senators organized and chaired an inter-school governing board to facilitate student efforts to work across school lines. This list is only illustrative and in no way exhaustive of all the work of this year’s SAC membership. To foster a greater sense of community across schools, SAC worked to launch university-wide events. From this work, the World Leaders Forum: Emerging Leaders event was launched as was the Let’s Talk series, which serves as a forum for students across the university to hear from and speak to university administrators and faculty working on issues of student concern. SAC hopes that administrative dedication to such a forum will help students offer constructive criticism in a manner that is open to the entire student body. SAC has also worked to engage students with the wider community of Harlem. A number of student senators have begun to speak with their fellow students and administrators about community service graduation requirements. Others have begun to strategize about ways in which their schools can keep community needs in mind in the transition to the Manhattanville campus, through programs such as a Community Business Resource Center. The SAC is proud of its accomplishments this year, and thanks the University Senate for this opportunity to serve the university-wide student community. A 12/7/07 meeting with James McShane, Associate Vice President for Public Safety, and Susan Glancy, Chief of Staff of the Columbia University President’s Office, discussing University communication protocols for bias incident. [David Stone, Executive Vice President for Communications, declined an invitation to speak at this meeting, noting his perspective that bias incident communications are internal in nature and fall outside his area of responsibility. A 1/25/08 meeting with Chris Colombo, Dean of Student Affairs; Ajay Nair, Associate Dean and Director of the Office of Multicultural Affairs; and Kevin Schollenberger, Associate Dean of Student Development and Activities and Residential Programs, discussing relevant student resources and communication protocols. A 2/11/08 meeting with Geraldine Downey, Vice Provost for Diversity Initiatives, and Professor Martha Howell, Miriam Champion Professor of History and Chair of the Subcommittee on Curricular Structure of the President’s Task Force on Undergraduate Education, focusing on issues relating to faculty and curricular diversity. Overall, the investigatory meetings were informative and productive. The guest speakers dispelled many concerns by simply providing information that is not widely known among the general student community. Accordingly, many of this report’s recommendations encourage greater communication of current initiatives and policies. The Columbia University Department of Public Safety has a clearly established protocol for responding to campus bias incidents. The Department’s protocol is in large part governed by compliance with federal reporting requirements, namely the Clery Act. The Department of Public Safety reasonably limits communication about campus incidents to incidents that fall within federal reporting requirements and other events that provide a sufficient immediacy of threat and gravity. A Deans’ Working Group, a three-year-old committee consisting of leaders of various schools, meets to coordinate responses and communication regarding campus incidents. The group is well-positioned to disseminate messages addressing campus concerns and sensitivities through the various schools’ deans’ offices in the wake of a campus incident. Although the Deans’ Working Group addressed past incidents, students noted a lack of consistency across schools in the timing and content of the group’s communications, as well as some schools’ failure to provide any information at all. The Department of Public Safety currently collaborates with the Deans’ Working Group by providing it with incident notifications. While there were inconsistencies among responses to last semester’s incidents, these inconsistencies were attributable to differences in University affiliation and the resulting lack of Public Safety jurisdiction, as well as a failure to report one of the incidents to Public Safety upon its discovery. The Division of Student Affairs has protocols for responding to incidents in a timely manner. Responses have typically included targeted student meetings and mailings. The Office of Multicultural Affairs (OMA) is a promising resource as a subdivision of the Division of Student Affairs for Columbia College (CC) and School of Engineering and Applied Sciences (SEAS) students. The OMA provides student advising and plays a programmatic role that includes proactive diversity training events. The OMA is transitioning from a traditional multicultural to a “polycultural” model of diversity, a model that recognizes a community’s multiple spectrums of diversity. In responding to bias incidents, the Division of Student Affairs often meets with leaders from underrepresented student populations and/or the identity group targeted by the bias incidents to identify potential trauma and necessary response. The Division also provides ongoing diversity trainings and workshops. The Office of the Vice Provost for Diversity Initiatives is continuing and expanding initiatives to increase faculty diversity with close attention to underrepresented fields. The Office has focused largely on addressing underrepresentation within the Faculty of Arts and Sciences and has addressed gaps at other schools through work with the Professional Schools’ Diversity Council. While the Office has made a remarkable impact over the last few years, its efforts should be expanded to maintain Columbia’s competitiveness among its peer institutions and solidify Columbia’s leadership in the area. Similarly, the Professional Schools’ Diversity Council should be fully utilized to ensure that diversity is adequately addressed throughout the University. The investigatory meeting with Martha Howell, Chair of the Subcommittee on Curricular Structure of the President’s Task Force on Undergraduate Education demonstrated that the subcommittee is aware of noted weaknesses in the Core Curriculum, most notably its uniquely Western orientation and two-thirds focus in the Humanities. There are obstacles to expanding the Core Curriculum, including a lack of funds to support and expand Major Cultures on the same scale as other key core courses and an insufficient graduate student population to support additional large seminar-based courses. arranging courses into smaller “pods” - small group classes exploring distinct subject matter that are coordinated to address a similar overarching theme (e.g., public health). The Department of Public Safety should continue its collaboration with the Deans’ Working Group. The Deans’ Working Group should continue to improve its coordination and standardization of bias incident communication, with an emphasis on the timeliness of messages to school communities. The Department of Public Safety should continue to publicize its bias incident response protocols through information sessions and its website. The Department of Public Safety should maintain its current requirements of immediacy of threat and gravity for communicating bias incidents. 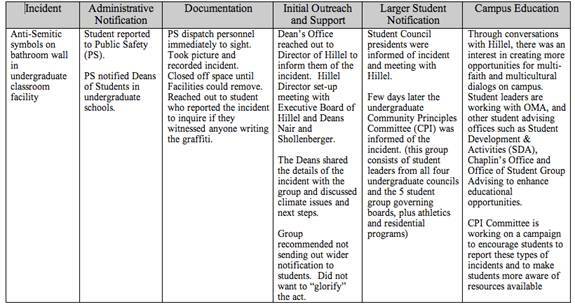 The Deans’ Working Group should set clear standards and protocols for the communication of all other bias incidents, and for supplementing Public Safety notifications to meet the needs of the University’s communities (e.g., addressing student concerns and denouncing activities that are counter to the University’s mission and principles). Members of the Deans’ Working Group should discuss the Public Safety response protocols and ensure that schools comply with them. Members of the Deans’ Working Group should also discuss and coordinate bias incident response protocols with members of affiliated institutions like Teachers College, which have separate governance and public safety personnel. In addressing bias incidents, the Division of Student Affairs should continue to address the targeted communities, defined as those deemed to be most vulnerable in the aftermath of an incident. The Division of Student Affairs should also ensure that members of the wider community are consistently involved in long-term response planning for the campus community and involved in short-term response planning whenever appropriate. The OMA should continue its efforts to provide support services to the undergraduate community with a continued focus on the following: cultivation of a polycultural understanding of diversity on Columbia’s campus, programming that proactively addresses and defuses issues of inter/intra-group conflict, and utilization of a varied (if not rotating) group of student leaders to avoid the entrenchment of particular ideas, approaches and values. The OMA should consider collaboration with graduate students and graduate identity organizations to increase school unity and to provide additional mentorship and support resources for the undergraduate population. The University should further support the activities of the Office of the Vice Provost for Diversity Initiatives and the Professional Schools Diversity Council to ensure their continued success and expansion. The Subcommittee on Curricular Structure of the President’s Task Force on Undergraduate Education should continue its thoughtful assessment of the content and composition of the Core Curriculum. The University should consider packaging curricular offerings across different disciplines to attract faculty candidates whose subject areas of interest are currently not offered by main departments as a separate field of research. Further expansion into studying diversity in terms of faculty with disabilities and comparative tenure rates and budget allocations for underrepresented groups here and at peer institutions will shed additional light on Columbia’s progress in achieving faculty diversity. The subcommittees of the President’s Task Force on Undergraduate Education should communicate their ongoing progress and their recognition of programmatic criticisms. The University should create a Task Force on Undergraduate Education webpage for this purpose, collecting student, faculty, and alumni input through a detailed questionnaire. How does the University determine whether an incident receives comment? How does the University determine when an act should be denounced? Which division of the University is most appropriate for addressing different acts? What is an acceptable timeframe for communicating incidents to students? In the aftermath of the Fall semester incidents, some students suggested that Columbia’s Department of Public Safety is the appropriate entity for relaying information about bias incidents due to the acts’ perceived relation to student security and the Department’s demonstrated ability to disseminate information rapidly. James McShane, the Associate Vice President of Public Safety, and Susan Glancy, the Chief of Staff for the University President’s Office, described policies regarding Public Safety’s response to bias incidents and factors that warrant use of their communication mechanisms. In addressing a bias incident, the Department of Public Safety determines whether an incident is governed by the Clery Act reporting requirements. When an incident does fall within a Clery category, the Department complies fully with the statute. As a result, the Department of Public Safety has clear reporting and warning provisions for many of the acts of animus that pose the greatest threat to student safety and to the wellness of a student community. Public Safety’s protocols also encourage students to communicate incidents to Public Safety, their Office of Student Affairs or to other appropriate school or University resources, even when the cited bias incident does not appear to involve a crime. Mr. McShane noted the existence of the Deans’ Working Group, a three-year-old committee that consists of the leadership of the various schools. Mr. McShane has recently added the working group to the Department of Public Safety’s notification list. He explained that the group determines what incident-related information to pass on to the student body (in addition to Clery warnings). Mr. McShane spoke positively of the group and indicated that they are working to improve coordination of responses to incidents. Some students have noted that the timing and content of communications about bias incidents can vary, and that some deans have not communicated the incidents at all. Accordingly this Committee recommends that 1) the Deans’ Working Group continue to improve its coordination and standardization of bias incident communication, with an emphasis on the timeliness of messages to school communities; and 2) that the Department of Public Safety continue its collaboration with the Deans’ Working Group. During the investigatory meeting, External Relations Committee members asked the guests to comment on student suggestions that the Department of Public Safety provide Clery-style notices for a broad range of bias incidents, including those that do not rise to the level of crimes. Mr. McShane noted that Public Safety is charged with providing accurate and timely information regarding incidents of a particular degree of seriousness and that additional reporting would undermine this role. Ms. Glancy further explained that the administration would not want the campus community to decrease its attention to Public Safety notifications due to an increase in their volume and breadth. The Committee appreciated the guests’ rationale and recommends that: 1) the Department of Public Safety continue to apply its current requirements of immediacy of threat and gravity for communicating bias incidents; 2) the Deans’ Working Group should set standards and protocols for the communication of other bias incidents, and for supplementing Public Safety notifications to meet the needs of University communities (e.g., addressing student concerns and denouncing activities that are counter to the University’s mission and principles). The individuals who discovered and addressed the offensive grafitti at SIPA failed to notify the Department of Public Safety. As a result the Department did not learn about the incident until after the story was covered in the campus newspaper. The Department was therefore unable to follow its usual investigatory protocol. Teachers College is an independent institution, with separate public safety staff and protocols. Accordingly, the Columbia University Department of Public Safety played a very limited role in the response to the noose discovered on the Teachers College Campus. The Department of Public Safety was promptly notified of the incident of anti-semitic graffiti found in a Lewisohn bathroom. Public Safety followed its proper protocols: the Department investigated the incident, notified the police, and prepared a report on the incident and worked in coordination with the dean of the school where the incident occurred. While there were inconsistencies in the responses to last semester’s incidents, the inconsistencies were due to differences in University affiliation and a failure to report one of the incidents to Public Safety. We recommend that 1) the Department of Public Safety continue to publicize its bias incident response protocols through information sessions and its website; 2) members of the Deans’ Working Group discuss the Public Safety response protocols and ensure that their respective school communities comply with its procedures; and that 3) members of the Deans’ Working Group discuss bias incident response protocols with members of affiliated institutions that have separate governance and public safety personnel. Students, particularly in Columbia’s undergraduate schools and at Teachers College, noted a need for support and outreach resources in the wake of last term’s bias incidents, especially outlets for discussion. The External Relations Committee sought to examine one approach to student services around bias incidents and on-going diversity training to foster a greater sense of tolerance on campus. In response to last term’s bias incidents, Nicholas Dirks, the Vice President of Arts and Sciences, Austin Quigley, the Dean of CC, and Gerald Navratil, the Interim Dean of SEAS, met with student leaders of targeted populations and emailed the student populations of CC and SEAS acknowledging their concern and expressing support. 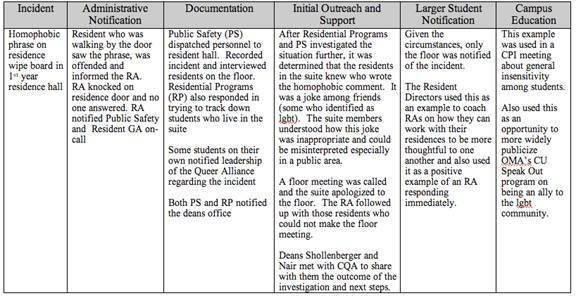 During the 1/25/08 meeting, Dean Nair circulated a copy of the Division of Student Affairs’ protocol for addressing bias incidents (see Appendix A). The protocol prudently involves all sections of the Division of Student Affairs: the Office of Multicultural Affairs (OMA), Residential Programs, and Student Advising. After any bias incident, Division staff meet with student leaders of affected groups. [In defining the “affected groups” the Division of Student Affairs identifies student leaders from the identity-group targeted by the act of animus and from other underrepresented identity groups that are considered particularly vulnerable to bias attacks. During the investigatory meeting, External Relations Committee members referred to the process of identifying and meeting with the affected group as “triage.”] These initial meetings often include decisions that set the tone for the broader community response. In discussing the protocol, committee members noted concern that the initial meetings with affected groups (referred to by the committee as a “triage” process) potentially exclude the involvement of other members of the community. The committee agreed that advisors should meet separately with members of affected groups to identify concerns that are unique to their perspective and solutions that are narrowly tailored to their specific needs. The committee stressed, however, that meetings that discuss strategies for the greater community response (e.g., the coordination of town hall meetings) should include a wide cross-section of the student community to encourage a spirit of inclusion and unity. Additional documentation provided after the investigatory meeting highlighted efforts by the Division to involve the entire student community and provide further education on campus diversity (see Appendix B). Through the discussion it became evident that the Division of Student Affairs naturally relies on a core group of student leaders to represent the wider student body in discussions with administrators. The Division recognizes that this reliance can place an undue burden on some student group leaders and it has involved additional students in related dialogues. SAC encourages the Division to continually involve participants from the Community Principles Committee, athletics programs and residential programs. The Division has included these groups in the past; this strategy is a good way to involve non-student-government and non-affinity-group leaders as stakeholders in community discussions. In serving its aim, the OMA provides mentoring, issue advocacy, opportunities for critical intellectual inquiry, social justice and inter/intra cultural programming, leadership development/training, diversity education/training, and cultural/identity student organization advising. During the investigatory meeting, Dr. Nair indicated that the OMA is moving towards a polycultural model for addressing issues of diversity. The polycultural model of diversity, which emphasizes points of cultural commonality, appears to be a more appropriate, timely and constructive model for an academic community than traditional multicultural approaches. OMA programming appears to be currently informed by both polycultural and multicultural models, and addresses multiple dimensions of diversity, including sexual orientation. We recommend that the OMA consider collaboration with graduate students and graduate identity organizations to increase school unity and to provide additional mentorship/support resources for undergraduate leaders. We also recommend that the OMA explore, as part of its current consultancy evaluation, the expansion of OMA’s programming to address the needs of Columbia’s international undergraduate population. [The consulting process is expected to be a nine-month process.] Similarly, the OMA should use the consultancy process to ensure that it comprehensively addresses diversity needs of all populations. Instead of solely focusing on responding to specific bias incidents, student discussions in the wake of last Fall’s bias incidents focused on the actions that Columbia’s administration, faculty and students can take to foster tolerance and diversity. Toward that end, students engaged in critical thinking about the University climate and posed questions regarding the diversity of Columbia’s faculty and curriculum. The forward orientation of such a dialogue provides an opportunity for information sharing among all stakeholders and enhanced best practices that can serve not only Columbia University, but also higher education more generally. We recommend that the valuable information sharing that occurred during these meetings continue and that student groups find ways to enhance the work undertaken by the Vice Provost of Diversity, Geraldine Downey, to increase diversity in the current faculty and to build a greater pipeline of minority faculty, as well as to channel proposals for curricular changes to the Core to Martha Howell, Chair of the Subcommittee on Curricular Structure of the President’s Taskforce on Undergraduate Education. To date, a total of twenty-five new faculty have been hired under the program. [The original target was 15-20 hires over 3-5 years. http://www.columbia.edu/cu/news/05/08/diversity.html] The number of African-American faculty in the Arts and Sciences has increased from fourteen, as of Fall 2004, to twenty-three currently. [SOA and SIPA are included under Arts & Sciences in this statistic.] Vice Provost Downey acknowledges that while the percentage increase was high, the numbers themselves are low. The Vice Provost for Diversity Initiatives also works with the Professional Schools’ Diversity Council, a group of faculty and administrators, which she co-chairs with Dennis Mitchell of the College of Dental Medicine. The Board of Trustees provided $2 million for small initiatives, such as travel funds for junior faculty, to advance diversity in the professional schools. The Vice Provost’s Office is currently gathering information on minority hiring increases within the professional schools and such information will be forthcoming. Vice Provost Downey’s work pays close attention to long-term institutional change in hiring practices at Columbia University. With attention to the present lack of a critical mass of faculty from underrepresented groups to press departments to increase recruiting, she has developed, in SAC’s view, a comprehensive approach to recruiting in-demand minority faculty and supporting underrepresented faculty in pursuing leadership roles that will hopefully serve to transform the hiring culture and pipeline development. Vice Provost Downey has instituted other approaches to reducing bias in the academy against new types of scholars with different backgrounds in research, gender, or ethnicity. [The Committee recommended packaging curricula offerings across different disciplines to attract recruits whose main department may not offer researchers in areas related to their subject of interest. Professor Downey noted that Stanford did well with a similar effort.] Her approach includes dinners with department chairs to discuss hiring and recruitment issues and collaboration with Arts and Sciences Vice President Dirks and Ann McDermott, Esther Breslow Professor of Biological Chemistry; Associate Vice President for Academic Planning and Science Initiatives, to encourage departments, especially in the sciences, to develop proposals for increasing diversity. The expansion of the applicant pool is also a main area of focus; in 2004 the Office aided Columbia’s launch of the Metro New York and Southern Connecticut Higher Education Recruitment Consortium, headquartered at Columbia, to provide a free job bank that lists all faculty and staff positions at the forty-two higher-education member institutions. The site features search capacity for dual-career families and can help in soliciting applications from diverse faculty. The Vice Provost for Diversity is also working to counter obstacles to hiring that especially affect women, who according to Vice Provost Downey’s office are less likely to apply to Columbia. Vice Provost Downey is doing this by informing potential applicants about Columbia’s new work/life office, back-up care for children and relatives at subsidized rates, and policy allowing the tenure clock to be stopped for each of two children. In addition, the new Luce Professorship for junior women in the sciences has had a great impact – the Physics Department has used it to make five hires. Regarding dual-career families, Columbia will be hiring someone to advise families on these issues. Pipeline development focusing on expanding the applicant pool in the medium-to-long term has also been undertaken by the Vice Provost for Diversity Initiatives’ Office through the development of bridge programs to potential applicants from underrepresented groups. The students serving on the External Relations Committee and the Student Affairs Caucus believe that student initiatives can expand support of the development of a pipeline of minority talent through mentorship between graduate and undergraduate students. The students serving on the External Relations Committee found the Vice Provost’s working definition for diversity in a subject area sensible. Instead of focusing on standard definitions of underrepresented groups, she looked to different definitions of representation in different disciplines. Instead of recruiting one ethnic group across the board, attention is given to whether that group is underrepresented in a subject area, such as Psychology. Curricular diversity has long been a topic in discussions of Columbia College’s Core Curriculum. While the External Relations Committee examined the Core in particular, we note that students also discussed ways to make the classroom, more generally, a space that fosters broader ideological exchange. Any curricular changes will require compensation and release time for faculty developing new curricula; currently such funding and release time are not available. Professor Howell’s subcommittee is also considering a recommendation for a new governance structure for the new curricula. The structure would provide for a central committee that would help coordinate activities with more specialized committees such as the Core Committee, College Committee on Instruction, the Dean of the College and the A&S VP. [Student members of this committee believe that such a structure could prove a valuable mechanism for incorporating student feedback, proper input solicitation and follow-up procedures should be considered in the establishment of such a governance structure.] Professor Howell’s overarching aim is to provide a core curriculum adequate for the 21st century, which she believes is not possible without serious attention to the Non-West. Some members of the External Relations Committee characterized Professor Howell’s presentation as the most articulate account of motivations to change the Core that they had heard. SAC looks forward to the President’s Task Force on Undergraduate Education report to be released in May. The Columbia University Senate's Student Affairs Committee serves as a united student voice on issues that concern more than one school, or on University-wide issues. My fellow co-chair Marcus Johnson and I would like to encourage you to bring such issues to our attention, through your Senator or directly to us. Additionally, we believe it is immensely important to know how to contact leaders from other Columbia schools. Below you will find the names and contact information of the student councils/assemblies/senates. Why should Teachers College Students Have One Voting Seat on the University Senate?